23 AVION - JETS : DECOLLAGE : BG COCKPIT / VOIX RADIO AU LOIN 1:20 No pilot voices. 25 AVION - JETS : ATTERRISSAGE : BG COCKPIT - COMMUNICATIONS RADIO AU LOIN 1:38 No pilot voices. 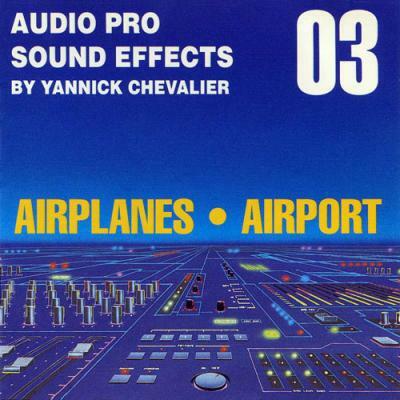 28 AVION - JETS : CABINE - AMBIANCE AVANT DECOLLAGE 0:51 No voices. 33 AVION - JETS : CABINE : AMBIANCE PENDANT DECOLLAGE 1:25 No distinct voices. 34 AVION - JETS : CABINE : AMBIANCE PENDANT VOL 1:55 No voices. Continuing with 34-02. 36 AVION - JETS : BG CABINE - APPROCHE / ATTERRISSAGE / ROULAGE 2:07 No voices. 42 AMBIANCES - TERMINAL D'AEROPORT : GUICHET 2:58 No P.A. announcements. 44 AMBIANCES - AEROPORT : ZONE DE LIVRAISON BAGAGES - LEGERE ACTIVITE 1:03 No distinct voices. 47 MECANIQUE - DISTRIBUTEUR : TICKET DE PARKING 0:16 Inside terminal. Coin handling, beeps, etc. 50 AVION - JETS : EMBARQUEMENT PASSAGERS - PASSERELLE / AVION 0:47 Footsteps, but no voices. 51 ALARMES - AEROPORT : CARILLON D'ORLY 0:22 No announcement. 53 AEROPORT - H.P. : ANNONCE DE DEPART FR & UK ACCENT 0:18 With Terminal bg. "...to Porto..."
54 AEROPORT - H.P. : ANNONCE D'ARRIVEE FR & UK ACCENT 0:07 With terminal bg. "...from Madrid..."
55 AEROPORT - H.P. : ANNONCE DE DEPART FR & UK ACCENT 0:18 With terminal bg. "...to Athens..."
56 AEROPORT - H.P. : ANNONCE DE DEPART FR & UK ACCENT 0:20 With terminal bg. "...to Corfu..."
57 AEROPORT - H.P. : ANNONCE DE DEPART FR & UK ACCENT 0:24 With terminal bg. "...to Belgrade..."
58 AEROPORT - H.P. : ANNONCE DE DEPART FR & UKACCENT 0:26 With terminal bg. "...to Marrakesh..."
59 AEROPORT - H.P. : ANNONCE D'ARRIVEE FR & UK ACCENT 0:10 With terminal bg. "...from Porto..."
60 AEROPORT - H.P. : ANNONCE DE DEPART FR & UK ACCENT 0:19 With terminal bg. "...to Algiers..."
62 AEROPORT - H.P. : ANNONCE DE DEPART FR & UK ACCENT 0:23 With terminal bg. "...to Douala..."
63 AEROPORT - H.P. : ANNONCE DEPART ARRIVEE FR & UK ACCENT HOMME 0:39 "Palermo...from Figari..."
66 AEROPORT - H.P. : ANNONCE DE DEPART UK 0:10 With terminal bg. "...to London..."